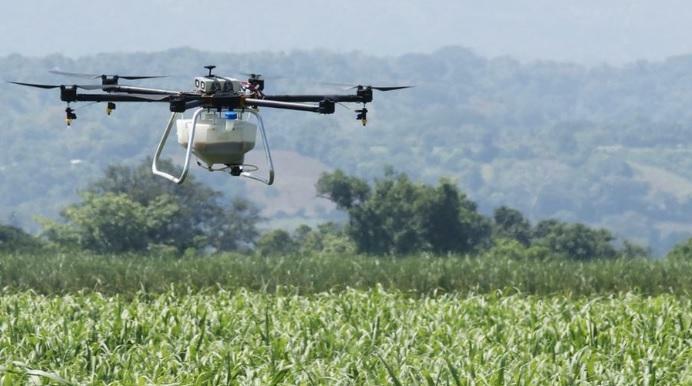 The latest drone technology is taking hold in the farming industry of the Central American nation of El Salvador. Huge unmanned drones called hexacopters have been fitted with 20-liter tanks that can disperse fertilizer or pesticides with computer precision. The drones can be programmed to follow pre-mapped routes and are capable of taking infrared scans of the fields to see exactly where they need to spray. Some of the fields are being sprayed for the first time in areas where it simply wasn't feasible for the local farmers to reach. Nick Nawratil, the chief operating officer of Hylio, is in charge of the trial. "We're spraying crops that previously have not being sprayed," Nawratil said. "That's one huge opportunity that drones are opening up." Because of the steep and uneven topography, farmers have not been able to spray crops with tractors or even planes. Now, drone technology is proving it has a lot to offer the farming industry. Nawratil speculates that the Hylio drone trials could improve crop yields by "tens of percent". Most of the drones deployed in El Salvador are trial based, but Hylio's technology is proving to have massive potential. Farmhands say the drones are able to improve the precision with which fertilizers, pesticides, or fungicides can be applied due to their ability to spray only what is necessary using GPS routes. A farmer in South Africa says drones reduced the amount of pesticide used on her farm by 30%. Drones are demonstrating that their efficiency can go along way toward reducing environmental damage caused by overuse of pesticides and fertilizers. Without excess chemicals running off into rivers and streams, aquatic life and biodiversity are subject to less harm. The Philippines recently announced that drones will be tested on 5,000 hectares of vegetable farms. Stelios Kotakis at the research firm IHS Markit predicted a few years ago that around 400,000 shipments of drones would be sent to agriculture and forestry sectors in 2017. "From a follow-up survey we did across the industry, we were pretty close to that number," Kotakis said.